View Conn’s Weekly deals, valid April 21 – April 27, 2019. View Conn’s This Week Ad best deals, and sale on: Samsung 55″ Curved UHD 4K Smart TV; London Bedroom Set; Samsung 24.5 Cu. Ft. Stainless Steel Side-by-Side Refrigerator; LG 24.1 Cu. Ft. Stainless Steel French Door Refrigerator; LG 23.9 Cu. Ft. Stainless Steel French Door Refrigerator; LG 4.5 Cu. Ft. Ultra Large Capacity Steam Washer; Samsung 4.8 Cu. Ft. Washer with Activewash; Titan Steel Sofa & Loveseat; Nobel Plush Reclining Sofa & Loveseat; Bentley Sofa & Loveseat; Key West Storage Bedroom Set; Charleston Bedroom Set; Sealy Posturepedic Copper Plush Hybrid Queen Mattress Set; iSeries Aim Super Pillow Top Queen Mattress Set; Tempur-Pedic Cloud Supreme Breeze Queen Mattress Set; Sony 65” UHD 4K Android TV; Bose Cinemate 15 Home Theater Speaker System; Frigidaire 25.5 Cu Ft Stainless Steel Refrigerator; and much more. 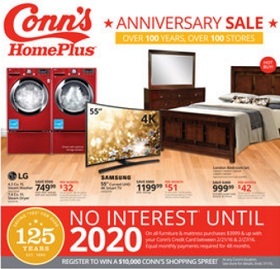 Find all deals, offers and prices in the latest Conn’s Weekly Sale Ad Circular.